DC Power Connector Converter CNT-X75. 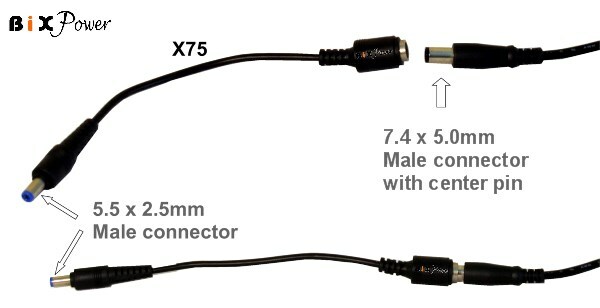 This connector one end is a 7.4 x 5.08mm female jack, another end is a 5.5x2.5mm male connector. 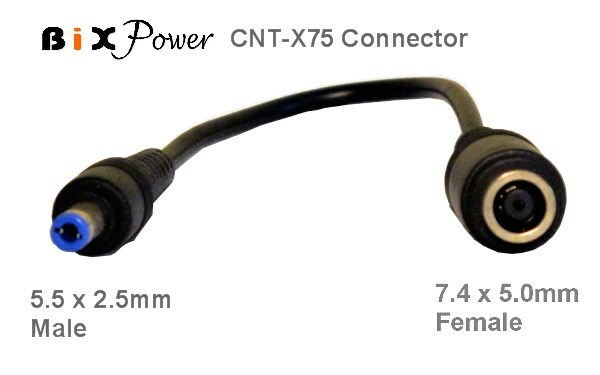 It can change a 7.4 x 5.08mm male connector with center pin (Outside Diameter 7.4mm, Inside Diameter 5.08mm) to a 5.5x2.5mm male connector (Outside Diameter 5.5mm, Inside Diameter 2.5mm). 7.4 x 5.08mm connector is widely used as Dell and HP/Compaq laptop power adapter connector. After you convert the 7.4 x 5.08mm connector to 5.5x2.5mm male connector, you can use our C series connectors to convert the 5.5x2.5mm connector to other size connectors if you need. Cautions: The 5.5 x 2.5mm connector on adapter can handle maximum current around 6A, which is around 120W at 19V ~ 20V. If you are using this adapter for more than 120W power, you may not use the 5.5 x 2.5mm connector on the adapter. You may cut off the 5.5 x 2.5mm connector and use inside two wires directly.